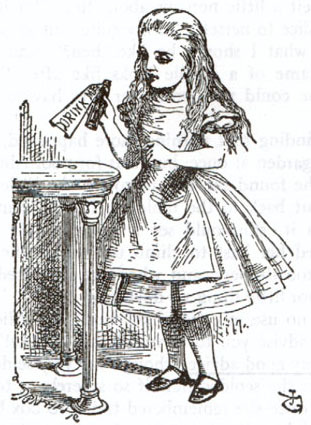 In Alice's Adventures in Wonderland, a children's book by Lewis Carroll, Alice finds a key sitting on a glass table. Behind a curtain on the wall she finds a tiny door that opens with the key and leads into a beautiful garden. The door however is too small for Alice to fit through. Looking back at the table she sees a bottle labelled "DRINK ME" that was not there before. She drinks and it causes her to shrink to a size small enough to fit through the door. Unfortunately Alice has left the key high above on the table. She finds a box under the table in which there is a cake with the words "EAT ME" on it. She eats it, thinking that if it makes her smaller she can creep under the door and if it makes her larger she can get the key. 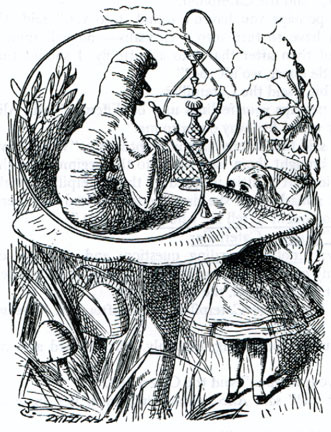 Later on in the story, Alice meets a caterpillar sitting on a mushroom. The Caterpillar crawls away into the grass, telling Alice that one side of the mushroom will make her taller and the other side will make her shorter. She breaks off two pieces from the mushroom. One side makes her shrink smaller than ever, while another causes her neck to grow high into the trees, where a pigeon mistakes her for a serpent. With some effort, Alice brings herself back to her usual height. She stumbles upon a small estate and uses the mushroom to reach a more appropriate height. Alice can access different worlds and migrate through portals through consuming substances that cause the effects of growing and shrinking. 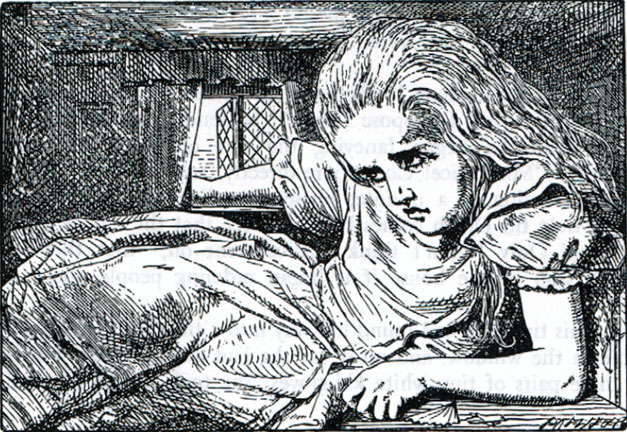 Alice's journey can be seen to represent the transformation of scales between the adult/child worlds. Her experimentation with eating and drinking the things she finds is resonant with the child's tasting of the toy car, of an exploration of the physical world without fear of consequence.